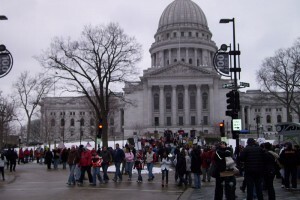 On December 1, the Wisconsin Department of Administration released new rules governing access to state facilities, including the State Capitol, for protests, rallies, demonstrations and any other “gathering of four or more people for the purpose of actively promoting any cause.” You may read the entire policy here. Nathan Kellum, Permit Schemes: Under Current Jurisprudence, What Permits Are Permitted?, 56 DRAKE L. REV. 381 (1985). The Court has emphasized that the indigent cannot be denied their First Amendment rights solely because they are unable to pay a required fee. The lack of an “indigency waiver” is not fatal in circumstances where an alternative means of expression exists that is available to the demonstrator, however where no such alternative exists there is ample precedent striking down restrictions on speech that do not take into account the demonstrators ability to pay. See Sullivan v. City of Augusta, 511 F.3d 16, at footnote 15 (1st Cir. 2007). In addition to what is formally referred to as the public forum doctrine, there are other strands of law designed to maintain ready access to opportunities for public expression. For example, even avenues of expression not strictly designated as public forums, such as the voting booth or the elective ballot, must be kept open to persons or groups of limited income, although it remains unclear which avenues will be held subject to indigents’ access and how poor one must be to qualify for protection. Clearly however, financial obligations cannot be fixed at a level or applied to groups or persons in a manner that effectively bars access to protected forums. Eric Neisser, Charging for Free Speech: User Fees and Insurance in the Market For Free Ideas, 74 GEO. L. J. 257 ( 1985). The State Capitol building is a unique location for the expression of protected speech, and there is no equivalent alternative location available to would be protestors. The Supreme Court has struck down advance payment requirements when officials are left with unbounded discretion to determine when the fee may be required and when it may be waived. Instead, the Court has demanded that the official charged with implementing the fee requirement must be given objective criteria to guide their decision. The ability to impose or waive a fee without any objective criteria allows the government official the ability to favor one viewpoint over another, and unbounded discretion transforms an otherwise content neutral regulation into a regulation that is directed at the content of the speech. The new DOA policy allows the State Capitol police to determine, with no objective criteria, whether or not to impose advance fees for public safety and in what amount, all in the context of groups containing as few as four protestors. There is some argument over whether fee policies must still contain written objective criteria for police in the context of parades and marches. The First Circuit has held that no objective written criteria are necessary when police officials estimate costs related to traffic control, street closures and parade security. See Sullivan v. City of Augusta, 511 F. 3d 15 (1st Cir. 2007). However, the Ninth Circuit has disagreed and ruled that the delegation of unbounded discretion to the police is a violation of the First Amendment even when it occurs in the parade context. Seattle Affiliate of the October 22nd Coalition to Stop Police Brutality, Repression and the Criminalization of a Generation v. City of Seattle, 550 F.3d 788 (9th Cir. 2008). And, in the context of a march and rally, the Eleventh Circuit struck down a regulation that allowed police to pass along the costs of additional police protection to those demonstrating in a public forum as a pre-condition to the granting of a permit. See Central Florida Nuclear Freeze Campaign v. Walsh, 774 F.2d 1515 (11th Cir. 1985). Regardless, the new DOA policy does not apply to parades, but rather to government facilities and in particular the State Capitol building. There is no dispute that the lack of objective criteria for the police to determine whether extra security is required violates the Forsyth prohibition on unbounded discretion when it occurs outside of the parade context — such as when advance fees are charged to cover security for campus speeches, Sonnier v. Crain, 613 F.3d 436 (5th Cir. 2010). See also Driver v. Town of Richmond, 570 F. Supp.2d 269 (D. R.I. 2008) (involving unbounded police discretion to issue permits for permission to post signage). The government may not use fees on First Amendment activities as a revenue raising device, but instead must clearly demonstrate that any fee is necessary to advance a legitimate interest in regulating the time, place and manner of speech. See Murdock v. Commonwealth of Pennsylvania, 319 U.S. 105 (1943). The state does have a significant interest in safeguarding public safety and property. However, the new DOA policy allows the police to charge for extra security for groups as small as four persons. The legitimate state interest in safeguarding public safety is not advanced by charging advance fees for groups of such small size. The state cannot demonstrate that a group of four persons will of necessity require the assignment of any extra security at all. Parades, rallies and concerts, where large numbers of attendees are expected, may justify the need for extra security and therefore may provide the state with a sufficient interest in charging an advance fee for security expenses. See, e.g., Thomas v. Chicago Park District, 534 U.S. 316 (2002) (upholding advance permit requirement for events of 50 or more people). However, the fact that fees may be imposed on events attended by large groups does not lead to the conclusion that fees may be imposed in advance any time the state wishes. The ordinance unquestionably applies, not only to religious causes, but to political activity as well. It would seem to extend to “residents casually soliciting the votes of neighbors,” or ringing doorbells to enlist support for employing a more efficient garbage collector. The mere fact that the ordinance covers so much speech raises constitutional concerns. It is offensive — not only to the values protected by the First Amendment, but to the very notion of a free society — that in the context of everyday public discourse a citizen must first inform the government of her desire to speak to her neighbors and then obtain a permit to do so. Even if the issuance of permits by the mayor’s office is a ministerial task that is performed promptly and at no cost to the applicant, a law requiring a permit to engage in such speech constitutes a dramatic departure from our national heritage and constitutional tradition. The constitutional hurdle of demonstrating a legitimate governmental interest before any regulation of speech can be constitutionally valid leads to inquiries about the size of the group impacted by a permit scheme and whether the government has an interest in regulating singular individuals and small gatherings. One of the most frequent justifications for the use of a prior restraint is the preservation of public safety and order. This oft-cited purpose of safety and order only gains practical legitimacy, however, if the ordinance in question seeks to regulate large group activities, such as parades and rallies. Courts entertaining this issue routinely hold that a permit requirement imposed on individual or small group speech to be overly burdensome. See Nathan Kellum, Permit Schemes, supra. It is therefore not surprising that we and almost every other circuit to have considered the issue have refused to uphold registration requirements that apply to individual speakers or small groups in a public forum. See Santa Monica Food Not Bombs v. City of Santa Monica, 450 F.3d 1022, 1039 (9th Cir. 2006) (“As the cautionary language in our earlier opinions indicates, the significant governmental interest justifying the unusual step of requiring citizens to inform the government in advance of expressive activity has always been understood to arise only when large groups of people travel together on streets and sidewalks.”); see also Grossman, 33 F.3d at 1206 (holding that the possibility that the ordinance at issue could reach “the actions of single protestors” rendered it unconstitutional); Rosen, 641 F.2d at 1247-48 (invalidating a one-day advance registration requirement because it applied to individuals and therefore “regulate[d] far more than mass conduct that necessarily interferes with the use of public facilities”); Cox v. City of Charleston, 416 F.3d 281, 285 (4th Cir. 2005) (“[U]nflinching application” of a permitting requirement “to groups as small as two or three renders it constitutionally infirm.”); Douglas v. Brownell, 88 F.3d 1511, 1524 (8th Cir. 1996) (“[A]pplying the permit requirement to groups as small as ten persons compounds our conclusion that the parade permit ordinance is not narrowly tailored [to advance the government’s interest in protecting the safety and convenience of users of public sidewalks and streets. ]”); American-Arab Anti-Discrimination Committee v. City of Dearborn, 418 F.3d 600, 608 (6th Cir. 2005) (striking down a permit requirement as “hopelessly overbroad” on the ground that the requirement could conceivably apply to groups as small as “two or more persons”). In summary, the new DOA policy is susceptible to legal challenge on the grounds that it is a facially overbroad infringement upon the First Amendment rights of protestors. This is because, as written, the new policy can be applied in a way that allows the state to impose advance fees on the indigent, on the basis of unbounded police discretion, and in circumstances where the size of the group affected does not justify any purported state interest in public safety. Potential plaintiffs do not need to wait and bring an “as applied” challenge to the law when it is actually applied against them in an unconstitutional fashion. This is because there is a long established First Amendment exception to the “as applied” rule that will permit a facial challenge to be brought. See Forsyth County, Ga., supra. The federal courts have approved advance fee requirements in certain contexts, such as overnight camping, parades and rallies. However, courts have consistently rejected regulations on the exercise of free speech that are so broad that they reach expressive conduct by small groups of people, whether by regulatory design or because government officials possess the discretion to apply the rules in such a fashion. The drafters of the new DOA policy seem to have taken language from a variety of permitting policies from other jurisdictions that have survived constitutional challenge, without regard to whether advance fees were imposed by those policies, or the relative size of the groups affected by the policies, or the context in which public expression was subjected to those policies. It is a mistake to assume that because advance fees may be imposed under the First Amendment in some circumstances that fees therefore may be imposed any time the state wishes. The state is not prevented from charging advance fees that are tied to objective criteria, such as the number of anticipated attendees, and that do not violate the three principles discussed above. The state is not prevented from assessing fees after the fact, in order to receive compensation for any damage actually caused by protestors. However, any prior restraint on the exercise of free speech should be designed carefully and crafted narrowly. The new DOA policy announced on December 1 does not meet this standard. Prof. Fallone, reading your strong statement on this on the top-of-page-one story in the Journal Sentinel made me proud (again) to be an MU alumna. Thank you, too, for this further explication. Thanks, professor. Ironically, these new rules come from the administration of a politician whose own party has regularly scripted self-described “spontaneous, unplanned demonstrations” at its own national conventions. Along with poll taxes in the form of voter ID requirements that cost money, and egregious electoral redistricting schemes, I think we can discern a pattern, here. Thank you for this analysis. Is it also true that there are greater expectations of free speech at the Capitol and grounds than at other state buildings or grounds? Also that the historical practices regarding the allowance of or restrictions on free speech are weighed heavily in determining what is reasonable? 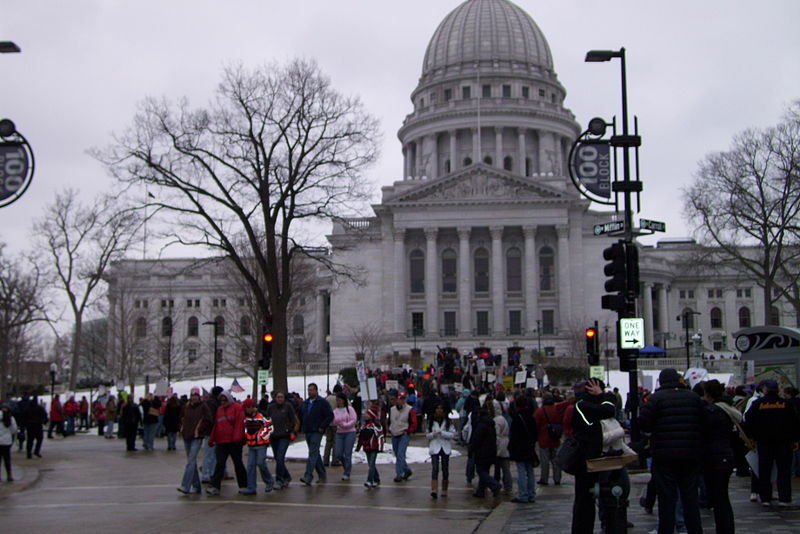 Yes, the Wisconsin State Capitol is a public forum, and that fact is significant in evaluating the manner in which the DOA policy restricts speech in the capitol building. See Gaylor v. Thompson, 939 F. Supp. 1363 (W.D. Wis. 1996) which can be viewed here. Note that a I have made a new post that incorporates and expands upon this point. You can read it by following this link.